I am eagerly awaiting my Nomad, and am trying to do as much reading as possible. With all of the possible end mills out there, does anyone have specific recommendations working in copper, brass, and silver alloys from 12 to 30 gauge. Typical size work is no more than 2"x 2". My main concern is ability to have visually clean detail. I don’t think with my size work area I will worry how much time it takes. I am looking 1/16" mills, however I see they go down to about .2mm!! Maybe a recommended starter set. I would have the same questions but more general: what bit for what job ? I understand tool shape (ball vs flat) but what diameter, number of flutes, material etc for what kind of job would be useful. Any good reference someone can share ? I bought some ball and end mills at 1/32, and 1/16. Will probably get some 1/64. I just say one of the 1/32 is a 1/64 in the machine right now for testing. Going to 1/32 or 1/64 increases the machine time quite a bit. I bought a number of 1/32" bits for a few bucks each off of ebay. I also have some engraving bits coming to test those out. To save time on cutting, you can highlight only the very small detail areas to cut with the smaller bits, and allow the larger bits to do the brunt of the work. Attached is my first attempt. This is .02" copper. The image is .01" deep. This was done with a 1/32" bit and also a 1/16" bit. I used the 1/16" bit to cut out the tag after the 1/32" bit broke after catching on the tape. For 2D work like that you probably should use a flat-end endmill rather than a ball, since you’re not contouring—it’ll extend the life of your tools and give you a cleaner bottom to the pocket with a LOT less time and effort! The three different types of ends that you’ll probably want to be aware of are flat, ball-nose and fish-tail, with the last one being good for certain materials (some plastics and composites in particular). Other fairly common geometries include tapers, ball-tapers, bull-nose, and lollipop, which looks kind of like your standard dremel ball engraving bit, but is considerably better. Generally the harder the material is the more flutes you would want, so you can keep feed-rates up while keeping chip-loads down. but for what the Nomad can push through a 2-flute or 4-flute is probably fine, because as you increase flutes you decrease chip evacuation room, meaning you have to go slower… which is what you’d do to decrease the lateral force required from the spindle anyway, so you have to account for that trade-off. For thermoplastics and some other particular use cases an “O-flute” cutter may be helpful, which is a single-flute cutter that can evacuate a lot of material quickly, which prevents the plastic from building up heat and melting or otherwise fouling the tool, but generally those need a higher speed-to-feed ratio, and the Nomad’s spindle is only rated but to go ~10-12krpm. For fine detail work in waxes or softer plastics engraving cutters or pyramid tools are a good option—they can give you a very fine end-point with a subtle wall taper and clean corners. I’ve been using an engraving cutter to cut fine lettering into hardwoods as well using a pencil-pass around the letters. The particular bit I’ve been working with is 0.005" at the tip and has a 7.5* (15* included angle) taper, and I run it at 10k rpm at about 450mm/min through 0.2-0.4mm of remaining material left after a ball-mill parallel pass. 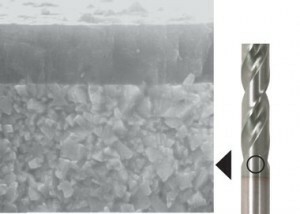 There are different coatings available for improving performance in different materials, but carbide and HSS bits are probably just fine for 95% of what we’re doing around here. Hope that helps give you some keywords to plug into Google!